This is a piece I am reluctant to explain too much. It must reach the eye and the mind and the heart—on its own, I hope. I ask and want it to ring loudly, or to whisper, but for itself and for its reader(s.) There are rituals that suggest that there is such a thing as a “safe word.” The montage of the poem with the darkly shadowed bells is one way for me to ask and to say—the bells are speaking now. Aren’t they? They have, before. But now is now. And now is when we live—while we still do. This is not a safe time. Of course, we know that. We know how precarious our time and each life is. We are trying like hell to defend against our breaking. We are nearly beyond any language that will stop what we fear. Or stop the lying. Or the memories. We have been living more consciously, but more tragically, in a time when each event insists that we are beyond breaking. That we are broken. And we want a word, a memory, an action—that says “stop.” Don’t we?? What occasions such a poem is simply—being alive in my time. Our time. And aching for—seeking a word, some word(s) that might bear what we are knowing, and what we are yet desperate for. Desperate for safety? For peace? For better memories? Of course. 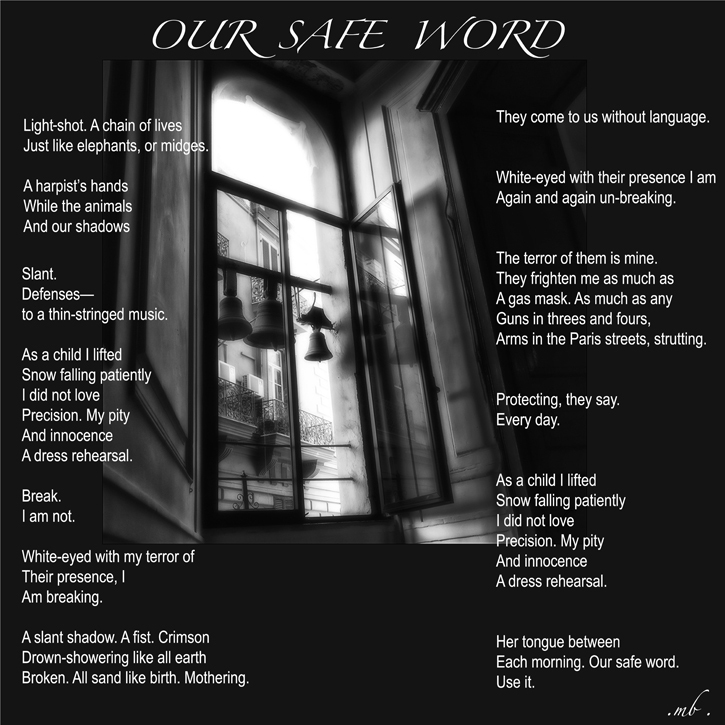 What word will make our lives safe? I’m trying, as you are—to find it. Margo Berdeshevsky - born in New York City, often writes in Paris. Her newest poetry manuscript was a finalist for the National Poetry Series, 2015. Her published poetry collections are Between Soul & Stone, and But a Passage in Wilderness (Sheep Meadow Press.) Her book of illustrated stories, Beautiful Soon Enough, received Fiction Collective Two’s Innovative Fiction Award, (University of Alabama Press.) Other honors include the Robert H. Winner Award from the Poetry Society of America, the & Now Anthology of the Best of Innovative Writing, numerous Pushcart prize nominations for works in Poetry International, New Letters, Kenyon Review, The Collagist, Tupelo Quarterly, Gulf Coast, Pleiades, Prairie Schooner, among others. In Europe her work has been seen in The Poetry Review (UK) The Wolf, Europe, Siècle 21, & Confluences Poétiques. A multi genre novel, Vagrant, is at the gate. Her “Letters from Paris” may be seen in Poetry International here: pionline.wordpress.com/category/letters-from-paris/ She may be found reading from her books in London, Paris, New York City, or somewhere new—in the world.